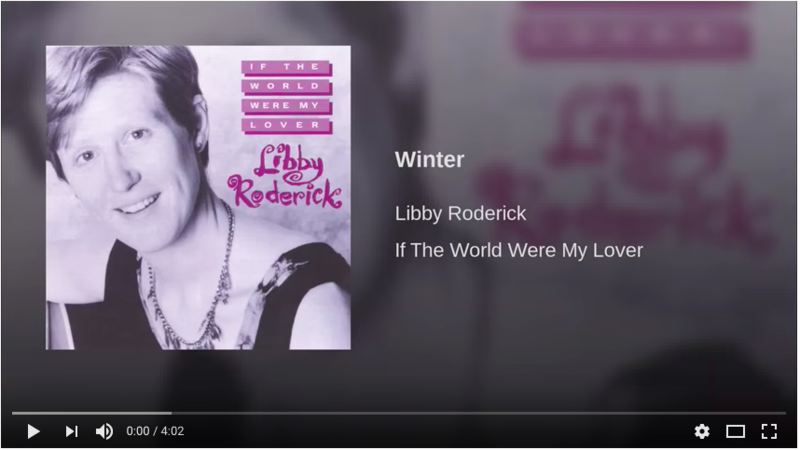 When I think of winter, I often get this song stuck in my head. You're probably asking yourself, "Wait a minute Zed, doesn't Tori Amos also have a song called Winter? You don't get THAT one in your head?" But no, in fact, this is the one that comes to me. Even though they were published at almost the same time (Tori's in 1992 and Libby's in 1993), somehow the guitar and sweetness of Libby's version is what comes into my ears. Growing up in Alaska, it felt like winter began in October. We'd almost always have snow on the ground by then (and it would stay until my birthday in April). Trick-or-treating was done in the dark, with glowsticks, and with snowpants or big boots to go with my halloween costume. So I don't think of winter solstice as being the beginning of winter — but officially, it is. Since we are past the solstice now, and the days are growing longer in the northern hemisphere, I also think about the passing of the dark and how valuable those long winter nights are for reflection, pause, cozy blankets, good books, mugs of hot drinks, outside snowy adventures, layers of soft and scratchy and other multiple other sensate fabrics. There is great value and insight in there, not just in the bright of the summer. It behooves us to remember and celebrate all the pieces, not just the sunshine. Spoken like a northerner, perhaps. 🙂 Well, hopefully you'll enjoy this throwback to early-90s feminist-folk anyway.